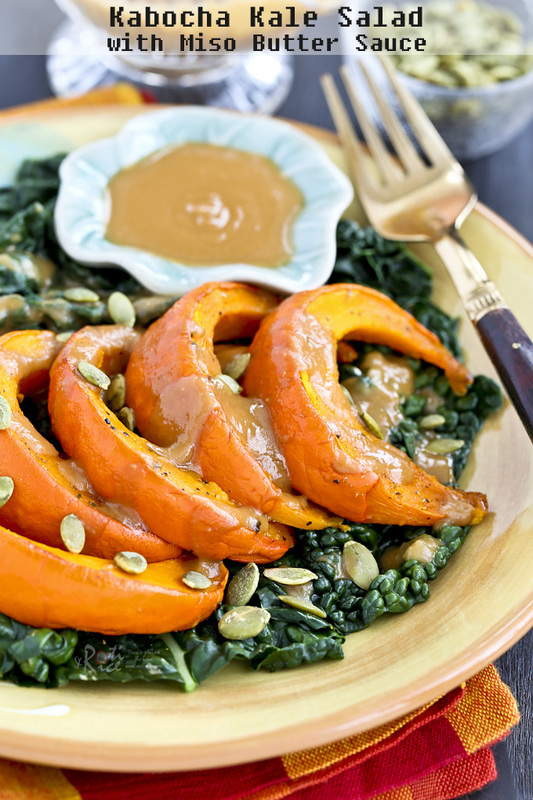 Healthy and warm Kabocha Kale Salad with Miso Butter Sauce, perfect for cooler evenings and days. Toasted pumpkin seeds provide crunch and texture. As mentioned in my previous post, Quinoa Salad with Kabocha and Roasted garlic, I only used half of the orange kabocha squash I purchased during the past weekend. 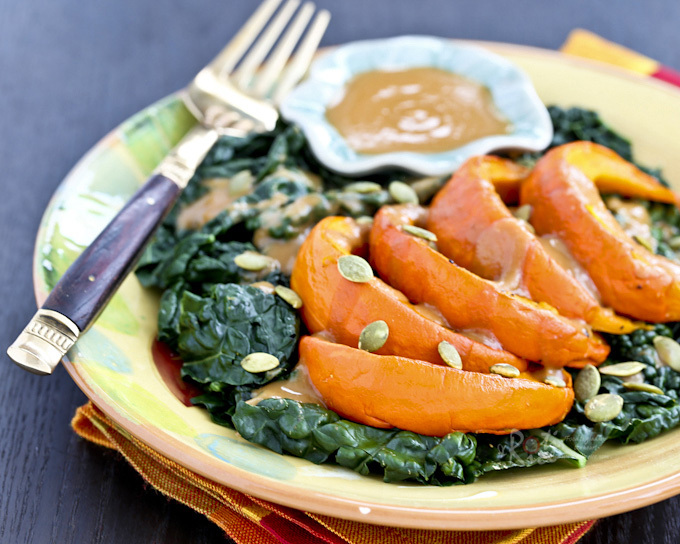 The other half was used for this healthy and tasty Kabocha Kale Salad with Miso Butter Sauce. I actually bought a bunch of vegetables for salad and this dinosaur (lacinato) kale was one of them. I figured the different tastes and textures of the two would be wonderful in a salad, not to mention the striking contrast of colors. To tie them together, I decided on an umami miso butter sauce. The reason it is called a sauce and not a dressing is because it has to be served warm because of the butter. If you have not yet tried miso butter, you are missing out. It is different and quite delicious. The first time I tried it was in this Pan Fried Miso Butter Pumpkin and absolutely loved it. Trust me, miso butter is good with all kinds of vegetables and seafood. You have to taste it at least once. For crunch, I added some ready toasted and salted pumpkin seeds from the health food store. I have to say I am really pleased at how this Kabocha Kale Salad with Miso Butter Sauce turned out. It was warm, tasty, and satisfying. I ate it as a light lunch. Place kabocha squash on an aluminum lined baking tray. Sprinkle salt and pepper over squash. Drizzle with olive oil. Roast in oven for about 45 minutes until tender. Rinse and drain kale. Remove center stem and cut leaves into 3 inch lengths. About 10 minutes before squash is done, place kale in a steamer and steam for 30 seconds. Remove and drain. Divide squash and kale onto 2 salad plates. Combine miso with sugar and ¼ cup (60ml) water in a small saucepan over low heat. Whisk to melt miso and sugar. Turn off stove but leave saucepan on heating element. Add butter and continue to whisk until a smooth sauce forms. Pour over squash and kale. Sprinkle with toasted pumpkin seeds and serve immediately.